Nikon D800, A: ƒ/16.0, ISO: 100, S: 1/13. Rondane National Park (Norwegian: Rondane nasjonalpark) is the oldest national park in Norway, established on 21 December 1962. The park contains ten peaks above 2,000 metres (6,560 ft), with the highest being Rondeslottet at an altitude of 2,178 m (7,146 ft). The park is an important habitat for herds of wild reindeer. The park was extended in 2003, and now covers an area of 963 km2 (372 sq mi) in the counties Oppland and Hedmark. Rondane lies just to the east of Gudbrandsdal and two other mountain areas, Dovre and Jotunheimen are nearby. 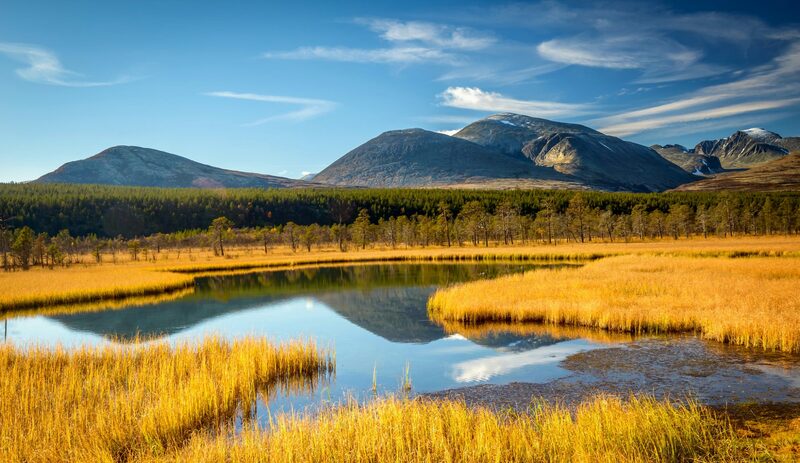 Rondane is a typical high mountain area, with large plateaus and a total of ten peaks above 2,000 m (6,560 ft). The highest point is Rondeslottet ("The Rondane Castle") at an altitude of 2,178 m (7,146 ft). The lowest point is just below the tree line, which is approximately 1,000 to 1,100 m (about 3,300 to 3,600 ft) above sea level. The climate is mild but relatively arid. Apart from the White Birch trees of the lower areas, the soil and rocks are covered by heather and lichen, since they lack nutrients. The largest mountains are almost entirely barren; above 1,500 m (5,000 ft) nothing but the hardiest lichens grow on the bare stones.